Holding up the Tube Transport System. The Statue of Liberty was a present from France to the United States in 1886 to celebrate the USA's 100th birthday. In the 31st century, it remains in the bay outside New New York. As a result of the stopping of the Earthican rotation caused by the Thubanians, however, the Statue was moved to Paris and destroyed the Big Ben in 3010 (6ACV08). 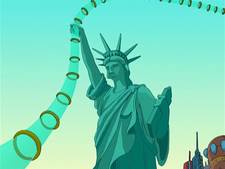 By the year 10000, the Statue of Liberty will have fallen, like many other statues similar to it that will be constructed by different societies inhabiting Earth, such as the ape statue, the bird statue, the cow statue, and maybe the slug statue (6ACV07). Just after falling on Paris. The falling of the ape statue is a reference to Planet of the Apes. The object in her hand changes from appearance to appearance. She has held a laser pistol in the opening sequence, part of the Tube Transport System (1ACV01), and her regular torch (1ACV12, 3ACV20, 6ACV03, 6ACV07). When the Omicronians invaded Earth for the third time, an Omicronian version was seen in New New York. It is unknown whether they renovated the Statue of Liberty or constructed a new one. This page was last edited on 15 November 2014, at 21:06.